The Chinese buffet restaurant near my house has a few Chinese drinks. Tried Guava juice. It was pretty good. Light Guava flavor. I went to The Fiesta grocery store near my house and noticed the international aisle for the first time. It wasn’t a huge selection of stuff, but what they did have was very interesting. I picked up a few things and will write more about those later. Today, I’m trying Berry Cassis. 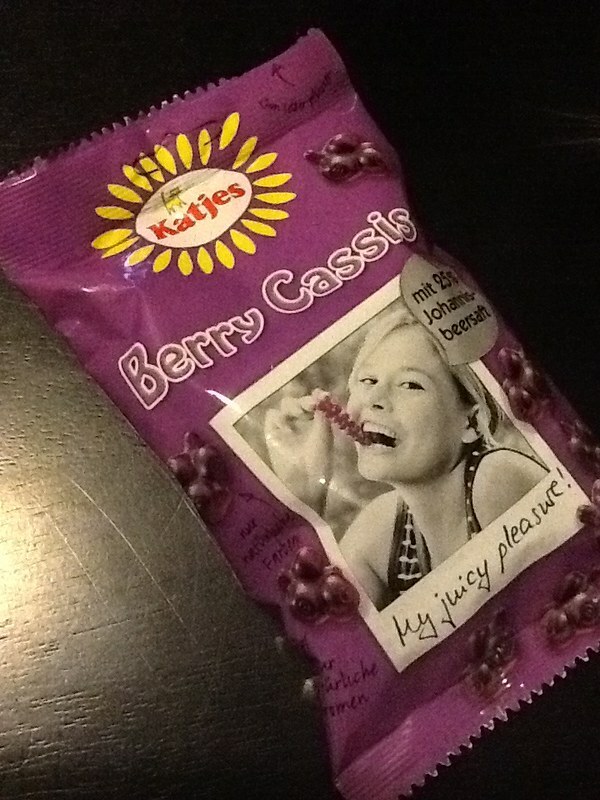 Berry Cassis is made by Katjes and is a German. Its a fruit snack, a bit like a Gummy Bear in consistency but not a candy product. It’s black currant flavored, which is quite good. I don’t know how to describe the flavor… a bit like a cranberry, but stronger.